DHUD4 is a recode, new features addition and optimization of Drathal's original DHUD. DHUD4 is Heads Up Display Addon that provides 4 sets of bar to display player, target, pet, focus, target of target and/or vehicle health and power, and target range, druid mana when shapeshifted and threat information. Additionally player buffs, target buffs/debuffs and special class abilities are tracked. 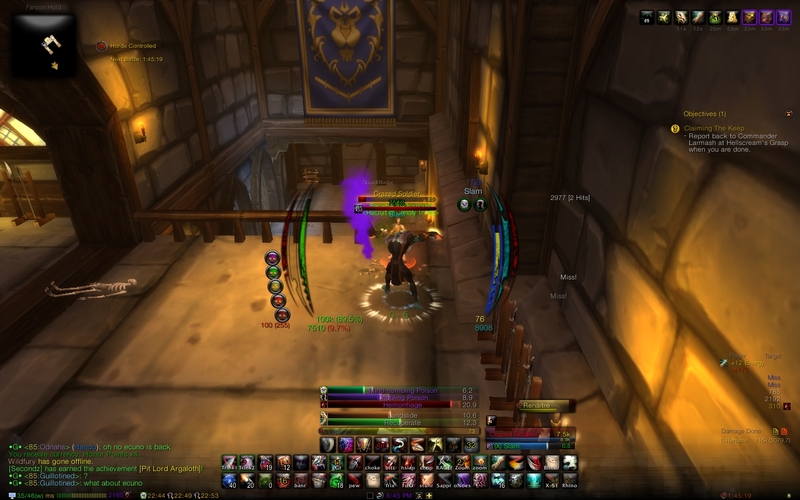 Two simple cast bars allow player and target casting tracking too. Bar text info and nameplates can be configured using DogTags. Renaitre's Profile: DHUD4 ships with a Renaitre preloaded profile to adjust the addon to the Renaitre UI layout. Focusing using drop down menu is now a protected function. Using the focus option in DHUD4 drop-down menus will generate an error. Selectable horizontal frame spacing and global vertical position. Tracking and layout options for player information. Two bars to track Health and Power(mana, rage, energy, focus, runic power). Bar's height and color change to provide visual information of current value. Option to swap player info to pet bars when in vehicle. Tracking and layout options for target information. Bar border color change according to class color. Show player buffs and/or weapon enchants close to expiring. Show/track abilities specific to your class applied to your target (DoTs, HoTs, etc), or Death Knight runes.